As fans of their beloved Sioux hockey team flock to Boston, I sit here in Grand Forks typing on my laptop. Adult things got in the way this year so I am admittedly disappointed that I won’t get to see UND haul the trophy around the ice on April 11th in celebration of their 8th national title. I’m not being cocky, I just truly believe this team is made up of exactly what you need to win the next 2 games. Strong goaltending and disciplined defense will be the key against a line touted as highly as the BU line is. Appearances on SportsCenter and every other college hockey news outlet is just what the doctor ordered for a BU team expected to win it all in front of their hometown. Hopefully the phenom, Jack Eichel, has his mind start to wander to Buffalo because you know he’s thinking about it. Meanwhile UND comes in with a healthy dose of balance that leaves you guessing who scores next, an unbelievably talented D-core, and the best goalie in the nation. It sets up perfectly for an early farewell party as Eichel rides off into the sunset and into his multi-million dollar NHL contract. A few other croc-wearing players UND should watch out for are Evan Rodrigues who scored 2 of the 3 goals in the regional finals vs. UMD and Ahti Oksanen. 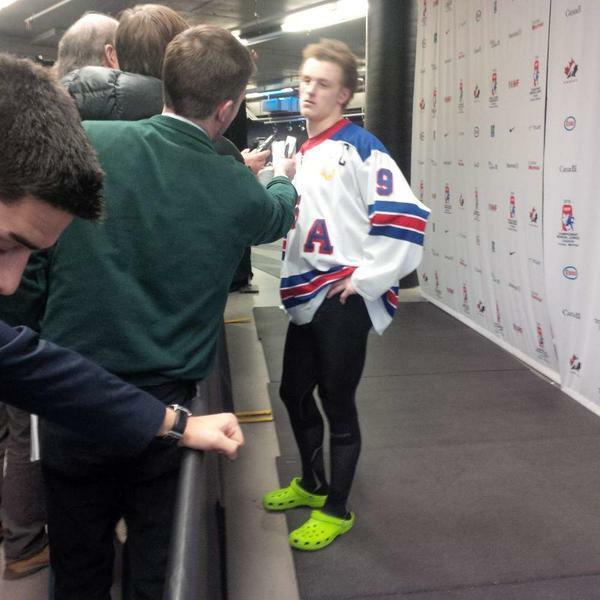 Oksanen is tied for the team lead in goals despite not playing on a line with Mr. Crocs. The BU goalie, O’Connor may be the Terriers weak spot. Despite putting up solid numbers on the season, O’Connor allowed the UMD Bulldogs to get back into the game by letting a weak wrist shot from the blue line hit off his catching glove, eventually ending up in the back of his net. UND would do well to throw a lot of the bad angle shots at the net that they have been successful with in the last couple of games. Testing O’Connor early is important because if he shows an early crack it could make the young BU team hold their sticks that much tighter. The fans and students alike could not have asked for a better performance from UND at the NCAA’s “neutral site” of Fargo, North Dakota. They responded at the end of the weekend with numerous chants from “Sioux For-ever” to the “Skate for Eight” shown in the above video. I’m starting to ascertain why East Coast fans enjoy “neutral sites”. Place a regional within 300 miles of Grand Forks, ND every year and you will see a repeat performance from the green and white faithful and most likely from the team. There was an undeniable sense that the fans were not going to allow the Sioux to be ousted in their own “neutral site” regional. And the boys did not let their fans down with their play in a pair of 4-1 to wins against the regular season ECAC Champs Quinnipiac Bobcats and the conference rival SCSU Huskies. – The fan support was phenomenal. 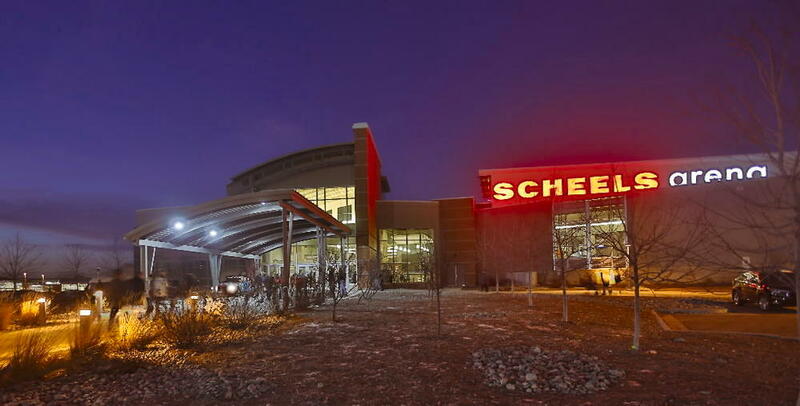 Scheels Arena seemed to be composed of the most die-hard fans willing to pay the premium price ($400-$1000) to attend the games. I didn’t notice any Quinnipiac fans there. Every time the sliver of SCSU fans tried to start a chant UND’s student section would drown them out by just making noise or starting a chant of their own. Attending the games truly made you glow with pride at being part of the amazing Sioux fanbase. – Despite the unbelievably successful event, I still imagined what the event would feel like 80 miles North in an arena twice the size. I suppose it would feel like the 2006 West Regionals. Time will tell if moving back to campus sites is an option, but if not UND will be putting bids in for the Fargo regional much more often. – Quinnipiac seemed to get shots to the net but Zane stood tall early and didn’t allow them to get momentum. That allowed UND to get the 1st goal of the game and from there it was all downhill. The 3rd goal, which was the 10th shorthanded goal of the season, was a thing of beauty with Stecher saucering a pass to Caggiula for the dagger. – St. Cloud scored 90 seconds into the regional final game which seemed to be a good recipe to shut the crowd up. However, the fans almost immediately started a “Let’s Go Sioux” chant. It was a pretty cool moment. -Andrew Panzarella scoring a goal was a good snapshot how deep this team is. His goal blew the roof off the place. – The dagger was Luke Johnson’s bad angle shot that hit the crossbar and landed near the goal line. Although Luke received credit for the goal I don’t believe it goes in without Michael Parks diving to swipe it through the goalie’s glove. Here we find ourselves for the lucky 13th straight year. A shot to attain the final goal that is the measuring stick of the Sioux program. That measuring stick is a national championship and nothing less. The sixteenth conference championship was a nice feather in the cap but it is merely a footnote to the footnote that is the NCAA championship, of which North Dakota holds seven of. This time of year will put fans, including yours truly, on the edge of their seats. It makes every fan become critical of the most minute details, breaking down every faceoff, puck battle, and pass. It’s because each missed connection, whiffed shot, or bobbled puck could be the small difference between glory or a debilitating letdown that leaves each of us waiting for October and the start of a new journey. The University of North Dakota had a disappointing conference tournament, no doubt, however tomorrow is a new day and a new tournament. To be honest, in UND fans’ eyes it is the only tournament that truly matters. The last time these two teams played a guy named Johnny Toews(you may have heard of him) scored 3 goals and assisted on a 4th. I hate to be the bearer of bad news but Mr. Toews will not be walking out of the UND locker room at 7:30pm tomorrow night. This Sioux team will not be depending on the skills of an all-world center, an Olympic shootout savant, or a Hobey Baker award winning goal scorer. This particular team will depend on all 4 lines scoring goals, the defense keeping players in front of them, and the forwards playing a strong 2 way game. The backbone of all of this is the goalie Zane McIntyre who has proven his worth time and time again over his 3 year career at UND. Quinnipiac comes in to this game alleging that their top scorer will not play, to skating him with a no contact jersey, to not commenting on him in the press conference. This stinks highly of QU coach Pecknold playing possum as if to catch UND off guard. I wish someone would tell coach P that one player does not a team make. Coach Hakstol couldn’t care less if they found eligibility for Sidney Crosby through a loophole. UND is sound defensively with their schemes and one player sure as hell isn’t going to change anything. Perhaps Pecknold did this to annoy fans like me, well it’s working. I already don’t like the guy but apparently I’m not the first. Onto the hockey side, QU brings in 13 players with double digit point production. They are lead by formerly mentioned, Sam Anas(if you don’t laugh you’re a better person than I), with 39 points. Matthew Peca is 2nd in scoring with 36 points. Peca was the Bobcat who received all of the recognition in QU’s 2013 run to the NCAA title game. That trip ended in a loss to the national champion Yale Bulldogs. Yale also ousted UND that year in the regional finals. North Dakota enters the game touting 16 players in double digit scoring led by Junior centerman Drake Caggiula, followed closely by Senior Michael Parks. These two need to wake up out of their funk and start producing for the Sioux to have a shot at a title run. Despite leading the team in scoring, Parks and Caggiula have only combined for 1 assist in the last 4 games. They will most likely be paired together on the 1st line and North Dakota would benefit greatly from them producing like 1st line players. The Poganski, O’Donnell, and Gaarder line have continued to tear up the score sheet despite the team’s recent letdowns in Minneapolis. They will need to continue their tear as well to assist in producing goals for the green and white to keep opponents off balance. Both teams sport decent records coming in, UND with 27 wins and the Bobcats with 23. However, QU has the worst SOS of any team in the tournament according to KRACH. They have the 32nd easiest schedule while UND sits at 8th. Quinnipiac has not played a team as good as North Dakota all year and I believe it will show. In the regional finals I predict UND will have a rematch with SCSU and come away victorious to punch their ticket to the 7th Frozen Four in the last 11 years. Just as I said last year, here’s to hoping I have a Frozen Four prediction column with UND in it next week. If someone could picture a better ending to this senior class’ last game in The Ralph, I’d like to hear it. The game seemed slightly reminiscent of last year’s 1st round game against the Tigers with both teams getting into the waning moments of the game knotted up. However, instead of the Colorado College Tigers forcing overtime, Bryn Chyzyk, Austin Poganski, and Connor Gaarder combined for a very timely play that electrified the 12k people in attendance. I’d break the play down but it wouldn’t do it justice so I’ll just leave the video here instead for you to enjoy. Friday night started out much as you would think a series would starring the #1 team in the nation and the 50th team in the nation. Admittedly it was not the prettiest start to the game but red-hot Nick Mattson glided down the boards and fed a pass to Brendan O’Donnell in the slot who one-timed it past CC Goalie Tyler Marble. It seems like this may be something we’ll see moving forward quite a bit. A quick aside on Nick Mattson, he seems to be playing with a ton of confidence and makes a play every time the puck is on his stick. You could argue he has been UND’s best defender since Christmas and I couldn’t be happier to see the senior defenseman back in the lineup and out of the stands where he spent a bit of time as a healthy scratch. Here’s to hoping Mattson continues his dynamite play throughout the end of the season. Once the game hit the midway point UND found themselves up 1-0 but it didn’t feel like they were playing all that well. However, 15 minutes into the 2nd period a goal from, who else, Nick Mattson got the team starting to buzz and effectively spelled the end of the game. A goal by Connor Gaarder late in the 3rd was answered early in the 1st by CC’s Matt Hansen, however UND piled on a couple more goals by Paul Ladue and Tucker Poolman to put the game out of reach at 5-1. Saturday night started out as you expect as well, trying to end a team’s season and the Tigers seniors’ college hockey career. CC scored first 15 minutes into the game but UND answered with a Jordan Schmaltz goal shortly thereafter. It was one of those goals where you scream for Nick Schmaltz to shoot but because he’s a 1st round draft pick and I’m not he sees his brother on the backdoor looking at a wide open net and makes no mistake. Ten minutes into the 2nd period Nick Mattson strikes again with a one-touch cross ice pass to O’Donnell who one-times it into the net before Tyler Marble can even think of pushing off to make the save. It was truly a thing of beauty and no goalie in the country(maybe save McIntyre) could stop that puck. If Nick Mattson can keep finding players like that it’s going to be a fun month left of hockey to watch. CC tied it up almost halfway into the 3rd period with a player coming around the net and sneaking in a questionable goal, by McIntyre’s standards, under his armpit. The play also could have been defended a little better to be fair but we were playing a desperate team. That all set up for the beautiful game-winner in the above video. Troy Stecher also made a play that went unnoticed by a lot in the crowd by diving to deflect a CC open net look that probably would have sent the game to overtime. 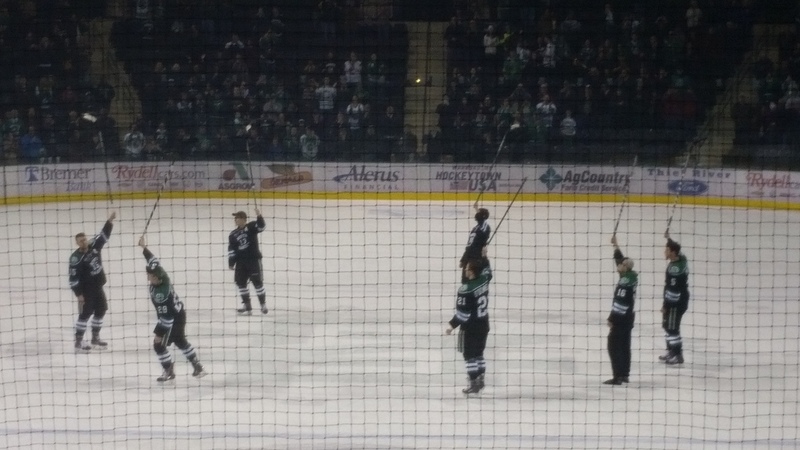 This allowed UND’s seniors to preserve their storybook ending to their time at The Ralph by being presented the Penrose Cup and skating it around the ice for the fans. The moment that stuck out was when Mark McMillan held it above his head which, of course, sent the crowd into a frenzy. Also, props to The Ralph for the added pyrotechnics. UND vs. SCSU– These teams can not have so short a memory to not remember the series 3 weeks ago that sling-shotted UND into first place. Some may say that’s an unfair weekend to base assumptions off because it was played in Grand Forks but this weekend won’t be much different. The Sioux fans are famously known for their penchant for travelling, especially to Minneapolis, to watch their beloved teams play so expect Target Center and Downtown Minneapolis to experience a level of green-out this weekend. I do believe this will play a factor in the outcome of this game. The previous meeting started with Mark MacMillan sacrificing his college hockey career to kill a 5 on 3 and ended with his teammates carrying him around the ice during an emotional senior night. Truth be told, I’d give the Penrose Cup back in a second if it meant MacMillan could be healthy for the rest of the year. I know this team has the “next man up” mentality and the depth to make it happen but even so, MacMillan provided a level of play on the score sheet and in the locker room that cannot be replaced. That being said, the team will have no problem moving forward towards the ultimate goal which will be as much Mark’s as anyone else on the team. I see this game being extremely close with SCSU’s season on the line essentially and UND looking to lock up the #1 overall seed in Fargo that allows them to play the “worst” of the qualifying teams. UND has played both these teams in about a month and I was at the Denver series. To be honest, they didn’t do a whole lot to impress me and UND should have swept them but let a Saturday 2 goal lead slip away. In Miami, the Redhawks were able to come away with a convincing Saturday win after allowing us to hoist the Penrose Cup in their building but the situation makes it less convincing to me. They got a lot of bounces, which admittedly are needed, to win the hockey game and it was a penalty filled contest with no real flow developing. However, I think Miami may be playing slightly better hockey at the moment. In the 3rd place game I predict SCSU takes care of Denver 4-2 and we see 6 NCHC teams in the national tournament. For the title game, UND gets to play some 5 on 5 hockey and takes care of Miami to hoist their 2nd of 3 trophies. The most exacerbating, excruciating and exciting time of the college hockey season has arrived. It’s time for the playoffs, where a team’s season is hanging by the thread of a goalie’s kick save or a favorable bounce off the post. The pressure drives fans to madness, sometimes covering their eyes or praying to the hockey gods for their team to pull out one more win. Blood, sweat, and tears are literally spilled on the ice for a chance to hoist college hockey’s most coveted trophy and be the only team that can be proclaimed national champions. This time of the year is tough as a college hockey fan. You always have a senior class that is skating for their last time at Ralph Engelstad Arena. This makes it tough from an emotional standpoint but at the same time there is a bigger goal to accomplish that needs to be focused on. I believe this class, as much as any other, shows the ability to put all of the nostalgia away until they hang up their skates and take off their UND jersey for the final time. Let’s hope when it’s taken off it can be hung on a national championship trophy. The road to glory starts tonight with a familiar first-round foe in the Colorado College Tigers. 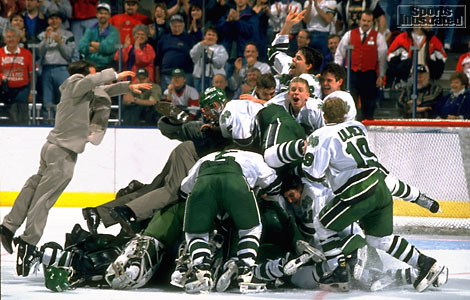 Rewind one year, and I was very disappointed after watching UND fail to close out Western Michigan to win the Penrose Cup and pushing them to the bubble of the NCAA tournament. Like last year, UND will play Colorado College at home in the 1st round. Unlike last year, Sioux fans can breath easy when UND needed to win their 1st round series to continue their season. This UND team comes into the tournament ranked #1 in the conference, Pairwise Rankings, and media polls. They could fall flat on their face in this series and still have a place saved for them in Fargo for the NCAA West Regionals. However, this team does not seem to be one that is content with anything short of winning every single game. Colorado College is coming off a promising shootout win and closely-contested loss at the hands of the University of Nebraska-Omaha Mavericks. The weekend before, CC most likely played their most complete game of the season in a 5-0 shutout win of the Western Michigan Broncos. Even with the win, however, the Tigers from Colorado Springs sit at 2 total conference wins on the year. They average a measly 2.15 GPG and allow a gaudy 3.88 goals per game to opponents, while UND sits at 3.34GPG and allows only 2.17 goals against. The one area CC does have an advantage on North Dakota is the powerplay, where they sport an impressive 21%. North Dakota currently sits at 20.5% but did have a terrible weekend against Miami going 1 for 8(12.5%) and allowing 2 shorthanded goals. The PP definitely needs to be a focus moving forward as these extra-man opportunities are critical to score on come tournament time. The signs all point to UND winning in 2 games however ending a team’s season is not an easy thing to do. I would expect 2 games similar to the game in Grand Forks on January 23rd where it took everything UND had to win by a score of 2-1. Although UND does not have to win the series to continue their season, I would much prefer if they did as I have already paid for a hotel and tickets to the annual NCHC Frozen Faceoff at the Target Center in Minneapolis, MN. It would be more enjoyable if I could watch some hockey in a sea of green similar to last year. So for that reason, I’ll be pulling hard for these wins. This series also happens to land on St. Patrick’s Day weekend. You can bet there will be some intoxicated fans at the Saturdy game that have taken part in the Leprachaun Loop in Grand Forks that rewards you for going to a slew of bars and getting a drink. It generally assists in ‘liven-ing’ the Ralph Engelstad Arena up in the absence of students that are on Spring Break but I digress. Western Michigan @ Miami: I think Western Michigan will make this interesting as they are also playing for their season but Miami’s talent is too much. Miami in 3 games. SCSU @ Omaha: St. Cloud State needs to get to Minneapolis for a chance at extending their season. Meanwhile, Omaha has struggled down the stretch and some of their inexperience is showing through. SCSU needs this series more. SCSU in 3 games. UMD @ Denver: Both of these teams are most likely in the NCAA tournament regardless or results from this weekend. I’ll give the edge to the home team here. Denver in 3 game. The fans in Oxford, Ohio celebrated a Redhawks’ Saturday night victory with an “overrated” chant directed at the University of North Dakota hockey team. I can only surmise these fans are either brain-dead or did not attend Friday’s game to see the league championship trophy being skated around their home rink, Steve Cady Arena. I have a feeling the Sioux hockey team, who is currently #1 in the country in both opinion and mathematical polls, had no concern of these silly chants as they took home the hardware for finishing 1st in the toughest league in the country this year. Would UND have liked to sweep this weekend? Absolutely, but they got what they came to Ohio for and a few thousand uninformed fans won’t change that. Friday’s game started with North Dakota carrying the play. The UND players must have seen a weakness on Miami’s starting goaltender, Jay Williams, as Troy Stecher took a couple of bad angle shots from the goal line. Sure enough, after an offensive zone faceoff win, Keaton Thompson carried the puck below the goal line and shot it between Williams’ pad and the post to make it 1-0 UND. Upon seeing the replay it was obvious what the players saw. Williams wasn’t square to the puck or holding the post, leading to an opening for a weak goal. The 2nd period scoring started with a 3 on 2 created by a couple of lazy Miami back-checkers making a line change. 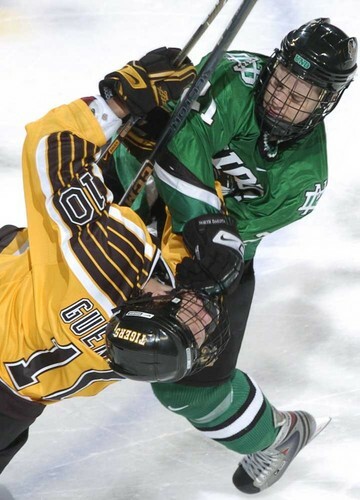 This allowed UND’s forward, Connor Gaarder, to walk in to the zone unmolested and receive a pass from Austin Poganski. He proceeded to beat Williams high on the glove side to make it 2-0 North Dakota. Miami poured it on for the rest of the 2nd period with shots from every angle of the rink but Zane McIntyre stood strong except for a powerplay rebound goal by Sean Kuraly that no goalie should be expected to stop. In the 3rd period, the Sioux did what they have done so many times and played solid in their own defensive zone with Zane providing the backbone all the way to the final horn for a 2-1 win and rights to the Penrose Cup. Saturday night started with a beautiful pass from Stephan Pattyn to Luke Johnson for a tap-in goal and it seemed like the green and white may run away with a sweep. However, on senior night the Miami players had some more fight in them as they answered with 3 straight goals. Luke Johnson scored on a breakaway in the 2nd period to bring the game to 3-2 and a 5 minute major called on Blake Coleman seemed to be promising for a comeback. However, a sloppy play led to an Austin Czarnik breakaway shorthanded goal for a hat trick. Then, confusingly, Miami fans threw cheap sunglasses onto the ice. I guess the fans didn’t believe Czarnik earned their hats for his efforts. Thirty-two seconds into the 3rd period Caggiula scored a PPG to again make it a one goal game at 4-3 but once again Miami scored to stretch it out to 5-3. Michael Parks scored on a rebound to make it 5-4 but the refs called a phantom goalie interference and that seemed to kill any momentum UND would have gained. An empty-net goal made the final 6-3 in a sloppily-played game on both sides of the ice. The negatives of this game were UND’s struggles on the powerplay, giving up 2 shorthanded goals to double their totals for the season and phenom freshman forward Nick Schmaltz going out after getting a knee to the head. The positives though are that this team did not quit and Coach Hakstol said as much, saying their battle level was still high despite wrapping up the league title the prior night. I was correct in predicting UND would win the league and that UMD would finish 5th. I also had Denver, WMU, & CC one spot away from their correct spots. Where I really missed was putting UNO last. I assumed that their young team and last year’s weak goaltending would be a huge issue this year. Obviously that did not come to fruition although they have really struggled down the stretch run of the season. Also, I assumed SCSU would be higher in the league at 2nd while they finished 6th. At times, SCSU has looked very good this year but other times they are quite pedestrian. “I’m going to Miami, welcome to Miami” is what the players are probably blaring over the charter plane’s speakers on the way to tropical Miami this weekend. I have to say I’m a bit jealous as the winter hasn’t relented even a bit in North Dakota. The town that’s famous for Heat fans leaving early from NBA Finals games and the lucrative Marlins franchise, Miami is… oh wait, what’s that?… I’ve just been informed that there is also a Miami of Ohio, but it’s actually in Oxford and that’s where the team is playing? I have to admit I’m quite embarrassed after rambling on about South Beach and texting friends that are on Spring Break to tell them they can catch a UND hockey game in Florida. Despite that mild disappointment, there should be some good hockey played between the #1 and #2 teams in the NCHC this weekend. One team(UND) has one hand on the trophy, they only need a single solitary point to rip it out of Miami’s grasp and send them back to Miami’s notoriously crazy club scene empty handed…er, crap I did it again. 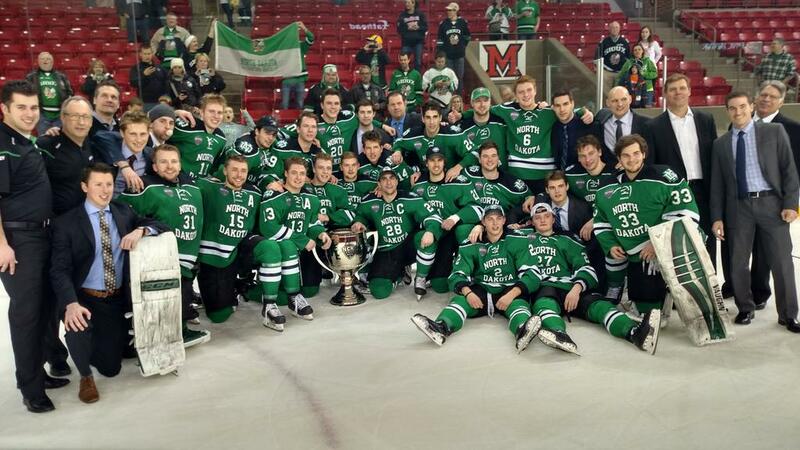 This series seemed like the make or break series for UND’s Penrose Cup aspirations. I was in the camp of either UND would keep the pedal down and sweep or have a lapse and get swept. St. Cloud has good forwards, solid goaltending and a dynamite powerplay and all were on display this weekend. The fireworks started, literally, when Nick Schmaltz found himself in a 2 on 1 twelve minutes into the 1st period. Nick toe dragged around a St. Cloud defender but was stopped by SCSU’s goalie Charlie Lindgren. He stuck with the play and received the puck back out front. From there he deked a Husky defender, then did the exact same to the goalie and slid it into the short side of the net. It was an electric way to start the series and ended up on the Sportscenter’s Top 10 plays of the day. Six minutes later UND found itself on the powerplay and Nick Mattson continued his phenomenal play on the point when he walked down the boards and slid a pass across the ice to Brendan O’Donnell. OD one-timed the puck past Lindgren before he was able to get over and set himself. The 3rd goal Sioux goal came 6 minutes into the 2nd period with Poganski finding the puck on this stick after a broken play. He made a quick release to the net which deflected off senior forward Connor Gaarder to get out to a commanding 3 goal lead. St. Cloud State needed a break and found it 8 minutes into the 2nd period when a Ben Storm slapshot deflected off Stephan Pattyn and into the top corner of the net. I was sitting directly behind the goal and I doubt there’s one goalie in the world who could have stopped it, but it got SCSU back into the game. The Huskies got it to within one with a Joey Benik goal in the 3rd period but could not find the equalizer late. However, they seemed to find the spark that they needed to carry over into Saturday night. Saturday night started much the same with an Austin Poganski goal early in the 1st period off a Connor Gaarder rebound. An unusual 5 on 3 was awarded to SCSU after this for a full 2 minutes. This led to the climatic moment of the weekend when shots were blocked by Drake Caggiula, Troy Stecher, and Mark McMillan. This brought the crowd to their feet in the most exuberant crowd reaction all season at The Ralph. Unfortunately it brought Mark McMillan to his knees as a Brodzinski slap shot hit him squarely in what appeared to be the knee. The “4th line” delivered again in the 2nd period when Connor Gaarder scored his 2nd tally of the weekend. Then deja vu with a Nick Mattson slap shot in the 2nd to once again gain the 2nd three-goal lead on the weekend. St. Cloud scored an inconsequential goal to ruin Zane McIntyre’s shutout but it never felt as though the lead were in danger. 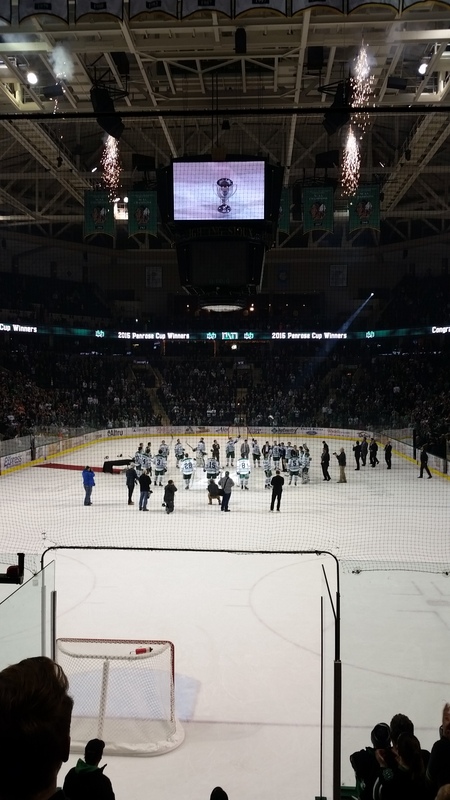 The scene after the game was a tough one that saw each of the seniors take turns assisting Mark McMillan around the ice in a stabilization boot while the crowd chanted “Sioux Forever” in tribute to the last class to have the privilege to wear the Fighting Sioux logo. It was a scene I will never forget and one of the coolest, while at the same time, saddest moments I’ve experienced in my 28 years of watching college hockey. The Fighting Sioux logo will always be a part of this community and this program, but to know that on April 10th we will not have one active player that knows what an honor it is to put that Sioux jersey is devastating, to put it mildly. The amount of pride and respect this city and state held the Fighting Sioux logo and it’s people in cannot be overstated and quite simply is indescribable. If you weren’t ever part of the Sioux family, explaining it is futile as words cannot adequately encapsulate the true meaning of something so engraved into the soul of a team, program, and a community. 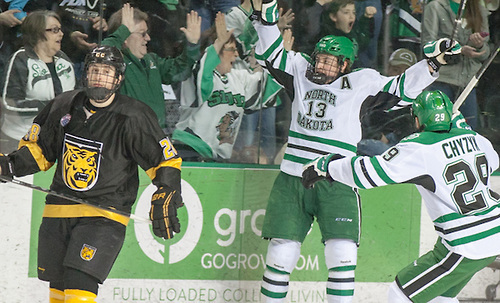 The third time’s a charm, at least that’s what the Sioux hockey players are hoping. The last 2 seasons UND has had a chance to win a conference title only to see it slip through their fingers on the last weekend of the season. The first time was the last year of the old WCHA which saw St. Cloud State and Minnesota share the McNaughton Cup. The 2nd was in the inaugural NCHC season where St. Cloud won sole possession of the first Penrose Cup. 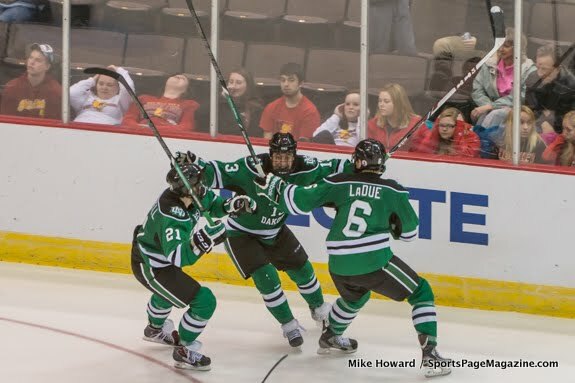 This time UND already has guaranteed a share of the championship but with at least one point, which would require they either make it to the shootout or win a game, the Sioux could put all that in the past and claim the league championship for themselves. If the season ended today, Miami and North Dakota would both be 1 seeds in the NCAA tournament. Miami comes into the weekend with the usual solid stable of forwards but similar to last year they have a question in goal. Jay Williams has been the most consistent of the 2 goalies but just last weekend was pulled in the Saturday game against Denver on the way to a 6-2 drubbing by the Pioneers. It will be interesting to see who Miami decides to start between the pipes, but I’d suspect it will be Williams. While Miami is a respectable 10-4-0 at home, UND is an even better 10-3-0 on the road. While Miami does have potent scorers, North Dakota comes in significantly better in the GPG category with a 3.39 to 2.97 edge. 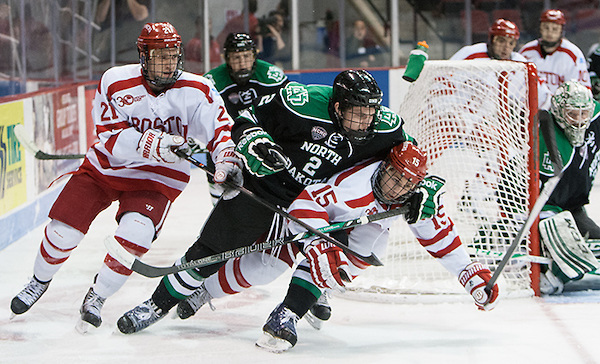 North Dakota also holds the 2.09 edge to 2.28 GAA on the defensive side and also has a small edge in both PP and PK %. This does not mean that I think this will be an easy sweep for the green and white however. Miami will most likely be losing a lot of talent next year between Seniors graduating and players going pro who stayed one more year. This means Senior Night will hold a very special place on their schedules. 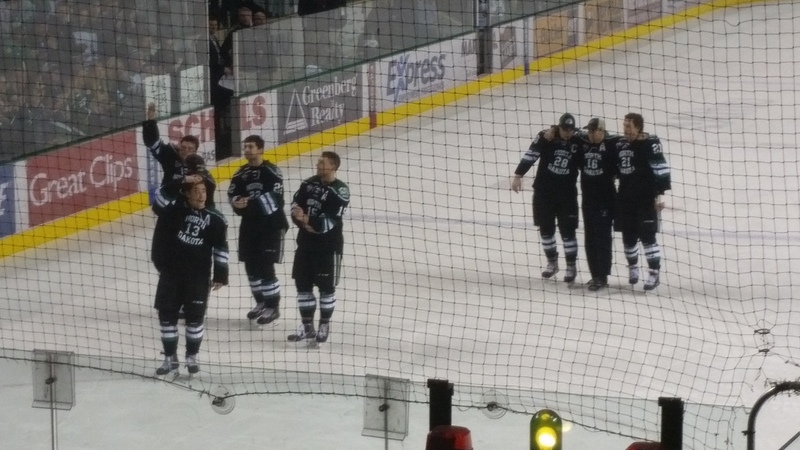 UND does enough to get the Penrose Cup.